Observed in the wild as early as 2016, Azorult is a Trojan family which has been delivered in malicious macro-based documents via spam campaigns, or as a secondary payload in the RIG Exploit Kit campaigns. On October 20th, 2018 we discovered that new Azorult variants were being used as primary payloads in a new ongoing campaign using the Fallout Exploit Kit. We named this campaign ‘FindMyName’ because all of the final exploit pages land on the domain findmyname[.]pw. These new Azorult samples variants use advanced obfuscation techniques, such as API flooding and control flow flattening, to evade anti-virus products. Also, we discovered that Azorult has further evolved, the samples we captured support stealing sensitive information in more browsers, applications, and cryptocurrency wallets than previous versions. In this blog we will cover the FindMyName campaign, the new Azorult malware, and the obfuscation techniques used. October 20th is when we first observed the new campaign we are dubbing FindMyName. In the following 3 days, 5 different URL chains, listed in appendix 1, led to the delivery of the Fallout Exploit Kit. All 5 different URL chains redirected victims to one domain, findmyname[.]pw. The steps in the first stage of FindMyName campaign are shown in Figure 1. Although the 5 final pages in findmyname[. ]pw were different, the content of them were similar. An example of the Fallout Exploit Kit landing page is shown in Figure 2. The Fallout Exploit Kit uses several html tags such as span, h3, and p to hide the real exploit code with highly obfuscated tag content. After decryption, the real VBScript code exploits an IE VBScript vulnerability CVE-2018-8174 which was patched in August. After the exploit succeeds, this Fallout Exploit Kit downloads a “.tmp” file to the %Temp% directory and calls CreateProcess to execute it. 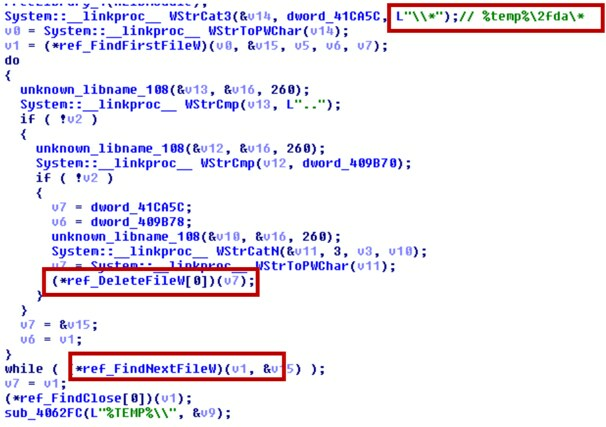 Further analysis revealed that the “.tmp” file was the latest variant of Azorult malware. It was the first time we’ve seen the new variant of Azorult malware used as primary payload for Fallout Exploit Kit. 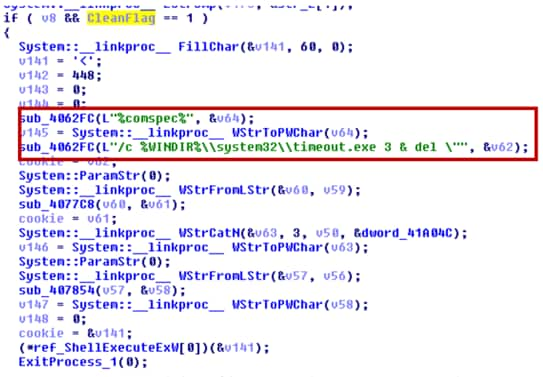 In this section, we focus on analyzing the latest variant of Azorult malware we captured. Evades anti-virus emulator through API flooding. Thwarts reverse engineering analysis through a control flow flattening technique. 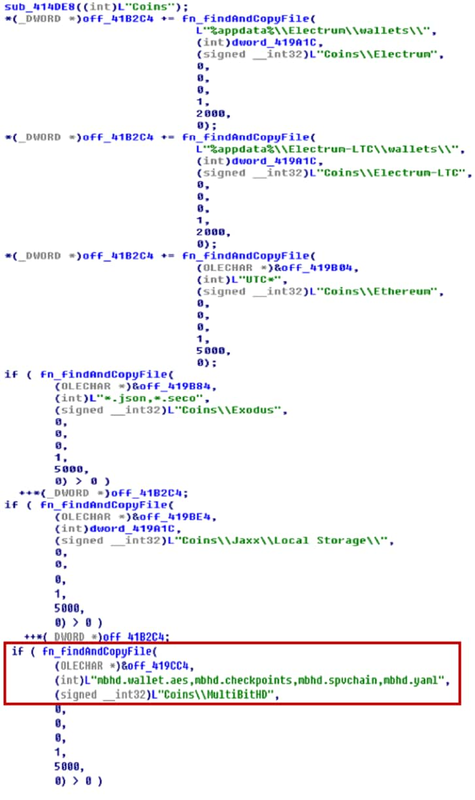 Uses a process hollowing technique to build the new malware image. Steals credentials, cookies, histories and autofills for more browsers than previous versions. Steals more cryptocurrency wallets than previous versions. Steals skype, telegram, steam, FTP client, Email client credentials and chat history when applicable. Harvests victim’s information via installed programs, screenshots, machine information, user name, OS version and running processes. Collects files from the user’s Desktop. Anti-forensic component, cleans up all dropped files. Executes specific file(s) initiated by C2 communication. 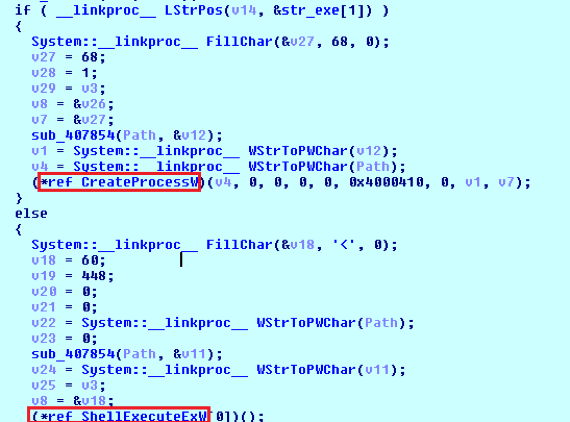 The initial Azorult malware was written in Microsoft Visual C++ 7.0. First, the Azorult malware attempted to use control flow flattening obfuscation to thwart reverse engineering analysis as shown in Figure 4. Second, the sample used an API Flooding technique as shown in Figure 5. API Flooding is a malware technique to evade anti-virus emulators. For timely performance concerns, anti-virus emulators set a timer when emulating the executable file on the host machine. If the emulator emulates hundreds of time consuming functions, the emulator times out and marks the file as benign. Azorult uses a process hollowing technique to build the new malware image. First, the sample decrypts the payload in the memory. Then the sample creates a new suspended process of itself. The sample then injects a decrypted payload to the new process. Lastly, the sample resumes new process execution and exhibits malicious behaviors. The overview of the sample execution is shown in Figure 6. The new trojan file dumped from the process was coded in the Delphi language. When the sample executes, it immediately connects to a C2 server for further instructions. In order to evade Intrusion Prevention Systems (IPS), the C2 traffic is obfuscated. 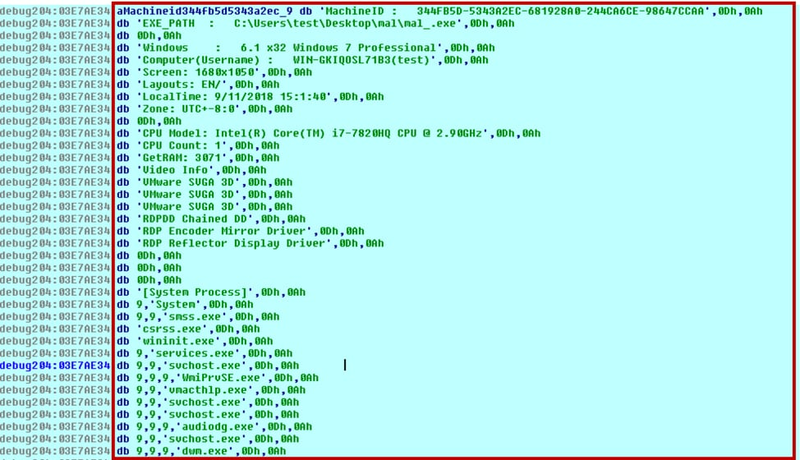 The data sent back to the C2 includes a unique victim ID for each victim’s machine by encoding the machine GUID , Windows product name, user name and computer name with hash algorithm. Then the malware decrypts a C2 address and sends a POST request to 51[.]15[.]196[. ]30/1/index.php with the encrypted victim’s ID. The C2 traffic is shown in Figure 7. The detailed example about hash algorithm and encryption is listed in Appendix 1. The sample decrypts and validates the C2 response. The decrypted C2 content had three parts. The part contained inside the <n></n> tags contains 48 legit DLLs which are used for information stealing, described in the following sections. The part inside the <d></d> tags contains application information for information stealing: application path, related registry and credential file names. The part in the <c></c> tags contains a C2 configuration for the sample. The C2 configuration is shown in Figure 8. According to pcap analysis, we identified the following characters checked by this sample. “+”: enabling the specific malicious function. 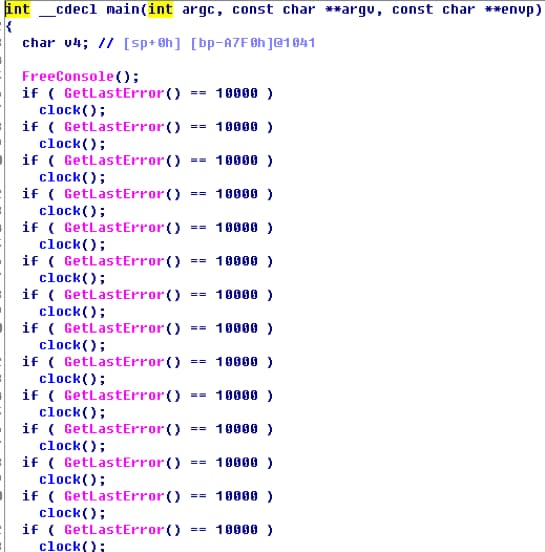 “-”: disabling the specific malicious function. “I”: collecting host IP info. “L”: downloading and executing file from remote server. Steal browser cookies, autofill credentials. Steal credentials from FTP client or Email client. Steal skype chat message main.db. Steal steam credentials (ssfn) and game metadata (.vdf). Takes a screenshot that eventually is sent to the attacker. Clean-up the temporary malware files. Get host IP information by sending GET request to ip-api[.]com/json. Download and execute file specified by C2. Figure 9 shows an example of C2 configuration for stealing sensitive information from Firefox and Thunderbird. The overview of C2 traffic is shown in Figure 10. The sample stole credentials and user data from thirty-two browsers including Chrome, Firefox and Qihoo 360. The full list of browsers is in Appendix 2. To steal credentials from browsers, the sample downloaded 48 legitimate dll files from C2 response to %AppData%\Local\Temp\2fda folder as shown in Figure 11. These functions are used to dump sensitive browser information. For example, the malware tried to use sqlite3_* functions to get the Firefox browser history information as shown in figure 12. Here is another example of a user name and password being stolen, this time from saved Chrome data. The sample searched the path “%LOCALAPPDATA%\Google\Chrome\User Data\” for file “Login Data”. If found, the sample copies the “Login Data” file to the %AppData%\Local\Temp directory and called sqlite3_prepare_v2 function from nss3.dll to exfiltrate credentials with SQL query: “SELECT origin_url, username_value, password_value FROM logins” as shown in Figure 13. The malware also withdrawals cookies, bookmarks, and autofill information from the aforementioned browsers. Credential information is saved to PasswordsList.txt and cookies are saved to CookieList.txt. Th malware tries to find the specified file including sensitive information of cryptocurrency wallets. For example the sample tried to find and send “mbhd.wallet.aes” file located in “Coins\MultiBitHD” as shown in Figure 14. The sample steals credentials and user data from popular applications including Thunderbird, FileZilla, Outlook, WinSCP, Skype, Telegram and Steam. It also steals files from the Desktop. For example, the sample tries to find “D877F783D5*.map*” file under “%appdata%\Telegram Desktop\tdata” directory to steal sensitive information from Telegram as shown in Figure 15. The sample collects the user information including current processes, installed software, system language and time zone. The harvested credentials and user information are then sent back to the C2. Here are some highlights about system information stealing. The malware captures a screenshot of the victim’s computer and saves it to an image file named scr.jpg as shown in Figure 16. 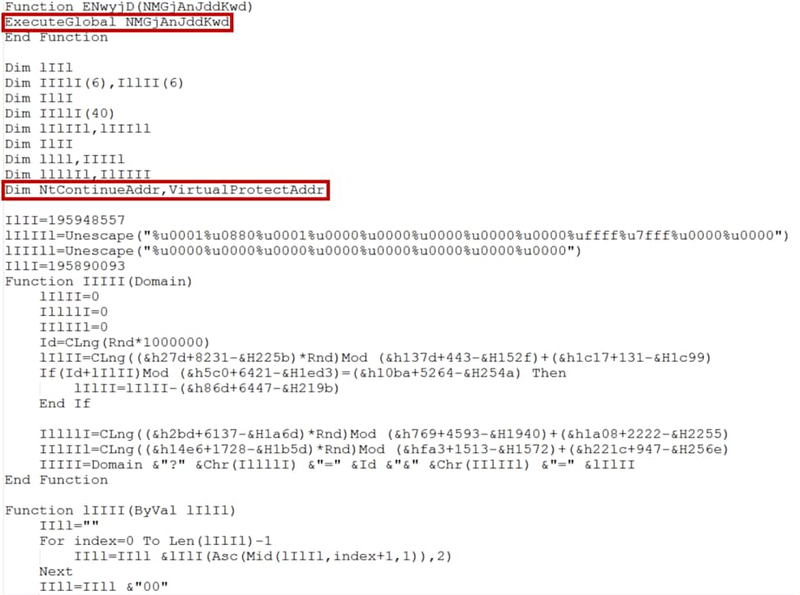 Malware uploads files from path and driver type specified by C2 response. Acquires host IP information by sending GET request to ip-api[.]com/json. It stores json response in ip.txt. Collects the following user information and saves it to system.txt. Current process lists by calling CreateToolhelp32Snapshot. All information gathered by the malware is shown in figure 17. The attacker can remotely control the infected system to execute any file through Create Process or ShellExecute as shown in Figure 18. We also observed that it had the behavior of accessing a malicious URL to get the file: plugin-update[.]space/download/10.17.18.exe. It will call WTSQueryUserToken and CreateProcessAsUser to start a new process with system privilege as shown in Figure 20. We also found that the malware erases all of the files located in “%temp%\2fda” and deletes files according to the C2’s command as shown in Figure 21 and Figure 22. A presumed new campaign surfaced in late October that caught our attention. In the span of 3 days, 5 Fallout Exploit Kit URL chains were observed, all landing on an exploit page hosted on domain findmyname[.]pw. There is a new variant of Azorult malware found to be used as a payload for Fallout Exploit Kit. It has updated features compared to the previous versions and supports stealing from more software and cryptocurrency wallets than ever before. Organizations with up-to-date Windows hosts have a much lower risk of infection. Palo Alto Networks’ customers are further protected from this threat. Our threat prevention platform detects both Fallout exploit kit and Azorult malware. AutoFocus users can track this activity using the AzoRult tag. Appendix 1: hash algorithm and encryption. When malware gets machine GUID, product name, user name and computer name, it uses the aforementioned hash algorithm and encryption algorithm to generate encrypted victim id. Malware uses xor key [0x09, 0xff, 0x20] to decrypt content in .data section and get string “aHR0cDovLzUxLjE1LjE5Ni4zMC8xL2luZGV4LnBocA”. Then malware does base64 decoding to get the C2 address.